So we’re off for a short break tomorrow. Long weekend mah so must make full use of it lor. And it’s also .. sobssobss… the last week of my freedom. HAHHHAA. Actually, I’m more than ready to get back to work. I miss working with children. And i miss having my own money. (woi. not that my husband neh gimme lah. It’s just that it’s different when it’s your own money.. kan kan kaaaan ladies?!) So yea, will update where we will be heading to tomorrow. And oh! I seriously enjoyed the answers I got on my IG when I asked them to guess where I was going. So cute lah you all. *it’s 2am and I still haven’t packed a single thing. Oooops. What to do with the kiddos during the June Hols?! Came across this blog – click link (the blog is pretty cool eh!) and thought that the blog provided quite a comprehensive list of activities for the kids for this June holidays. So if you’re worrying about what to do (pleaseee don’t let them be on electronic devices the whole day please……. ), doooo check it out to get some ideas k? Will probably add to this post if I come across more blogs. We decided that in Japan, we didn’t want to take any cabs because it can be quite costly so we had to figure out the way from Narita International Airport to our apartment in Sangenjaya. Our host has provided us very precise instructions on how to get to her apartment so that made things pretty easy for us. Or so we thought. after like one whole month of procrastinating and putting off my dates with my blog, I did it. Yes. I freakin did it. I converted my blogspot.com to wordpress.com and then to a .com. ALL BY MESELF! (actually nolah, GOOGLE.COM was my best friend. And I still don’t like you, DNS, HTML and all your coded friends. ) My brain somehow managed to figure out how to get around everything. HEHE. So, finally, liveandlovelove.com. So we booked 6 nights 7 days trip to Japan without knowing whether it was enough or not. We just jumped into it, like oklah, let’s book 7 days coz’ next day I need to work. LOL. So we try to make do with our 7 days. We.. or rather Fauzie researched like crazy. HEH. My husband has his own research and he added it in together with other suggestions. Kak Sharon (ermm as in DSP Soh in COL. heeee) recommended going to Yokohama coz’ we can make our own instant noodles there! I was sooo excited but Boss say cannot because no time and too far. Haiyaaaa bossss ar. In the end, we came to a conclusion.. 7 days was not enough to do everything. Like real only, confident only we thought 7 days can cover alot of things. Sobs. So we came to a conclusion and locked down a few confirmed places to go. Ok now, come read my next post to see if we managed to achieve all that hor ok? HOMG. 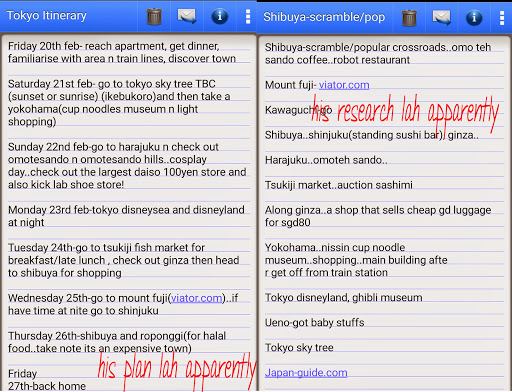 I am going crazy tryna sort out this blog. WARGHH. I seriously hate htmls. Nehmind. I am going to do this. and until I figure out this wizardry I call html and dns or whatver, I am NOT going to open my blog. I am going crazy. HELPCH. OKAY, nehmindddd, I will do my write up on Japan first! YESSSSIR I WILL.